Christianity has influenced Aboriginal spirituality in many ways, and many Aboriginal people are Christians. Aboriginal and Christian spirituality can sometimes peacefully coexist in the same person's belief system, and churches open up to this change. Percentage of Indigenous Australians who are Catholics . Percentage of Indigenous Australians who are Anglicans . Percentage of all Catholics in the 2006 census that were Aboriginal . Percentage of Catholics on Palm Island, 22% are Anglican, 24% other Protestant, 5% no religion and 1% Baptist . Can Aboriginal people be Christians? Christianity has influenced Aboriginal spirituality in many ways ever since missionaries (forcibly) taught Aboriginal people the Bible. Since many Aboriginal people have been in missions and subject to Christianisation it would surprise if these influences hadn't manifested in their spirituality. Some old mission communities have become a centre of Christian revival, expressing an Aboriginal understanding and spirituality . Some volunteered to accept Christianity as their only religion, others integrate elements of Christianity into their spirituality and expressive ways while not giving up their Aboriginal beliefs. The acceptance of Christianity today by some Aboriginal people is increasingly dependent on the example and teaching of Aboriginal advocates . Christianity is strong in the Torres Strait, where some football teams gather for prayers before games . Christian beliefs can also mingle with beliefs about the Dreaming, allowing them to reconcile two different viewpoints. Aboriginal people use their deep spirituality to comprehend Christianity. "We syncretised Christian teachings with our own beliefs; it wasn’t hard," reveals Stan Grant, the Indigenous affairs editor for Guardian Australia . "My people also believe in a divine single creator – Baiame. He made the land and rivers and gave the people our law. The idea of a God and commandments and stories of genesis and the tribes of Israel and exodus seemed very familiar." Sometimes Aboriginal people need to fuse the western with the traditional way in order to find out who they really are . The Wontulp-Bi-Buya College in Cairns, QLD, supports the development of Aboriginal church and community leaders through study programmes in theology and ministry. Students undertake studies in Biblical foundations, theological reflection, personal development and field ministry. But many Aboriginal people also blame Christians for the dark sides of history and prefer to sit on a beach and talk about spirituality than visiting a church . Watch what indigenous historians have to say about Christianity. In this 15-minute clip Onondaga Faithkeeper Oren Lyons (Iroquois Confederacy, northeast North America), Native Hawaiian historian Davianna McGregor, Australian Aboriginal elder and former Catholic priest Patrick Dodson, and Anishinaabe (Canada, USA) author and activist Winona LaDuke offer their insights into the history of Christianity in relation to indigenous peoples around the world. Smoke can be compared to incense used in Christian ceremonies. Fire reminds of the scene where God spoke to Moses through fire. Water matches the notion that Jesus is understood to be the source of living water. Blossoms can be related to the sacraments. "Spiritually speaking I come from Jesus"
Steve, an Aboriginal man from the Sydney region, told me that he does not believe in the Dreamtime or Indigenous spirits. For him Jesus and God are the sole deities he believes in. Some day, he told me, God "revealed himself" to him. He believes in and reads the Bible but has to deal with the disapproval of some of his fellow Indigenous peoples. "For me the Bible has answered all my questions about the past, present and future," he explains. "Its history is in line with modern day historians. Scientists confirm its authenticity. Mathematicians are astounded and amazed concerning the bible code found in ancient texts predicting names, events and catastrophes past and still to come." "With this knowledge how can I not let go of former beliefs. I still respect the culture and honor the elders. Traditions and customs such as preservation of the land and native land title I'm very passionate about. It in no way conflicts with my chosen faith." "The God that I believe in is for Aboriginal people to help them with better education, health and letting go of substance abuse introduced by the British ruling classes. By practicing Christianity I become a better Aboriginal [person]. I don't smoke (introduced). I don't drink (introduced). I don't swear (introduced). I promote preservation of the land and respect to the elders." Steve concludes: "Biologically I'm part-British and part-Aboriginal. In terms of my soul I'm Aboriginal. Spiritually speaking I come from Jesus and to him I shall return." I once met an Aboriginal elder who was well versed in the Bible. When I asked him why he told me that since the Bible seemed such an important book to white people he had to find out more about it. Shortly after taking up boxing, Aboriginal man Anthony Mundine became a Muslim. He was influenced through Malcolm X. "I read his book and that got me interested in Islam and I started to learn about religion," Mundine says . Then shared it with his children. Did they crucify you to share my blues? With a Bible in his hand. He was traded for my land. Poem by K L Burns, MRRC Silverwater Correctional Centre . Read more Aboriginal poems. When Russell Kapeen was 32 years old he has had a hard time all his life. He was an alcoholic, fighting and getting into trouble. Now almost 60 years of age, Russell is a different man. "In all that time [since] I've never had grog, smoked or sworn," he reveals. Mutton birding, or just 'birding', is one of the few traditions that have remained unbroken by the attempted assimilation of Tasmanian Aboriginal people. Around Easter time, instead of the traditional Christian feed of fish, Aboriginal children get a feed of mutton birds, sing in palawa kani (Aboriginal talk) about mutton birds, dance and make baskets lined with feathers of the bird to fill with chocolate eggs . The Tasmanian Aboriginal word for mutton bird is yula. Traditionally, churches have barred Aboriginal culture from their services and asked Aboriginal people to ‘leave it at the church door’. Churches viewed Aboriginal beliefs and customs as pagan and demonic. This new way of reaching out to Aboriginal people is important to address their view of the church as a contributor to their dispossession and disadvantage. “We identify and understand the importance of culture within the proclamation of the gospel,” says Gurindji man Christopher McLeod, the first Aboriginal bishop in the Anglican Church in SA. “Anglicanism as it spread around the world has been able to adapt itself to proclaim the gospel in a cultural context which is intelligible and understandable. Many Torres Strait Islander people are Christians because missionaries arrived here in the 1870s. Their arrival meant that traditional Torres Strait Islander customs and beliefs met Christian theology. Every year on 1 July Torres Strait Islanders celebrate the "Coming of Light" or arrival of Christianity on Erub (Darnley) Island, Thursday Island, in Cairns and Townsville, remembering 1 July 1871 when the missionaries from the London Missionary Society arrived. Fred Gela, Mayor of the Torres Strait Island Regional Council, explains : "On July 1, 1871 the Torres Strait changed forever. On that day, Dabad, one of the tribal elders of Erub Island, met the missionaries at Kemus Bech, where he denied his tribal laws and accepted the good news of salvation." "For many people globally, the coming of Christianity meant the end of traditional beliefs. This was not the case in the Torres Strait. Christianity was embraced and the light of God was welcomed into our everyday lives with our culture informing and playing a huge role in shaping our understanding." The festival marks the interaction of the two ideologies . Ceremonies can be quite similar. "The Christian mass of sharing the bread and wine is similar to a part of Islander culture known as 'good pasin', where things of value are shared among community members", says Desley Boyle, Aboriginal and Torres Strait Islander Partnerships Minister for Queensland . The Coming of Light festival has physical, cultural and spiritual significance for all Torres Strait Islanders. "This is a very special day as being a Christian has made our lives better," says one of the islanders, and another adds "My great, great, great grandfather Jimmy Dai brought the missionaries by boat from Darnley to Murray Island and told our ancestors they were good people. All the islands used to trade before the coming of Christianity." Follow the life of Nathanael Pepper of the Wotjobaluk people who converted to Christianity in 1860 and tried to reconcile the apparently irreconcilable. This book offers an in-depth look at First Nations' theology and parallels its key themes with Old Testament thoughts. Noel Loos interweaves his own more than twenty years' personal experience with Yarrabah and other Queensland Aboriginal communities along with the voices of Aboriginal people, missionaries, and those who sat in the pews and on subcommittees and Boards in the cities. Others integrate only parts of Christianity into their lives and artwork. Paintings of the Daly River (Nauiyu Nambiyu) community, a former mission 300 kms south of Darwin in the Northern Territory, are one example. The community is still closely connected to the catholic church. 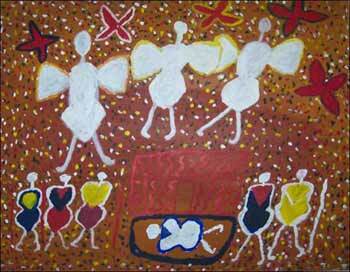 Aboriginal artists like Miriam-Rose Ungunmer-Baumann and Mary Leahy Pumbum created paintings showing Christian scenes. The inclusion of Christian stories and symbolism in traditional Aboriginal art and spirituality is often perceived as out of place and alien. "My own spirituality came flooding back"
Richard Campbell from the Gumbaingirr and Dhungutti people recalls the moment when he realised how close Christian and Aboriginal stories can be . "A Catholic priest once asked me to connect Aboriginal spirituality with Bible stories through a painting. "When I started to paint, I felt my own spirituality come flooding back and I started to remember the stories of my people. That's when I became aware of the similarity between Aboriginal and Christian stories. "We all have a spiritual connection..., we all belong to one big God—call it Christ, we call it Birrigun, we are all one in God."